Located in the North Atlantic Ocean, directly east of Greenland, Iceland is Europe's westernmost country and the second largest island in the North-Atlantic ocean. Its capital, Reykjavik holds practically half of Iceland’s entire population, perhaps not surprising considering how little of the country is actually habitable. As such it is the country’s unrivalled cultural and economic centre surrounded by a vast wilderness of mountains and glaciers. The city’s highlights are mostly found in central Reykjavik: lining Old Town and Lake Tjornin are attractive tin houses, some of the more historical buildings, and many of its restaurants and nighttime hotspots. Its nightlife is legendary, with all-night street parties in summer and a huge club scene year-round. The nearby surrounding wilderness offers walking trails at Videy Island or the lava area at Heidmork, is definitely worth a visit. At "Smoky Bay" you can see geothermal steam rising from the ground. Harnessed to heat the city, these smoke signals can be seen along with any number of natural wonders, half an hour out of town. Port Location – The port has two main sections. Gamla Hofnin (City Harbor), the older section, is situated close to the city centre. Transport Links – Public transport is good, with a network of buses serving Reykjavik and its suburbs, while taxis are always available. Flight time is only 2-4 hours from Europe and 5-6 hours from east coast USA. 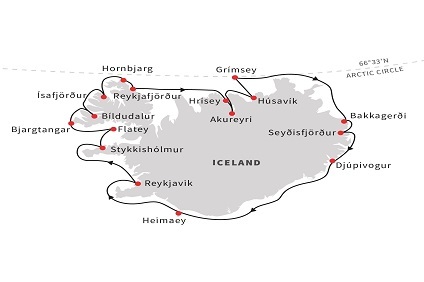 It is possible to get to Iceland by sea as well. There is one passenger and car ferry service that sails during the summer to Seydisfjordur, a town on the east coast of Iceland. The Smyril Line ferry runs between the Faeroe Islands, Norway, Denmark and the Shetland Islands in the north of Scotland. The ferry makes a complete journey once a week throughout the year. 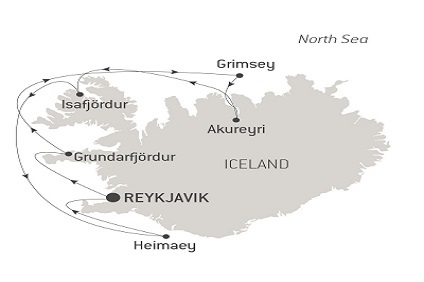 11 Night Cruise sailing from Reykjavik roundtrip aboard Spitsbergen. 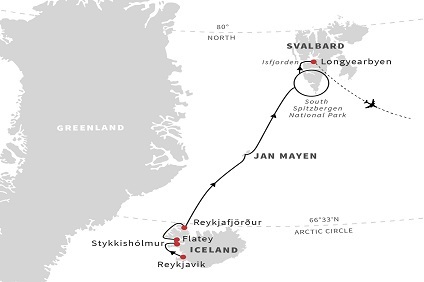 9 Night Cruise sailing from Reykjavik to Longyearbyen aboard Fram. 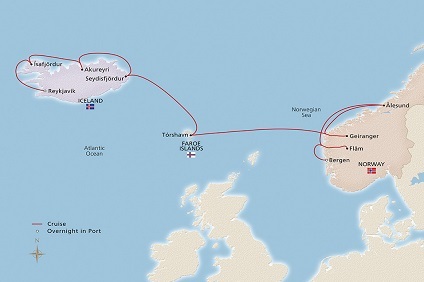 30 Night Cruise sailing from Reykjavik to Dover onboard Seabourn Quest. 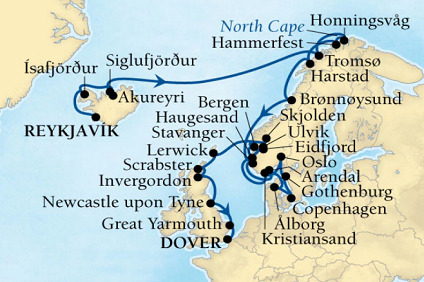 15 Night Cruise sailing from Reykjavik to Copenhagen onboard Seabourn Quest. 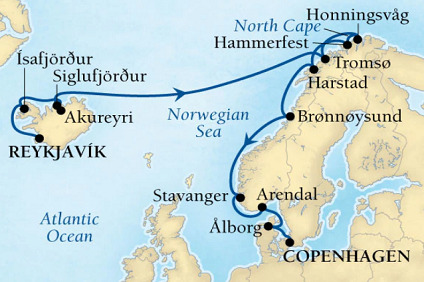 12 Night Cruise sailing from Reykjavik to Bergen aboard Viking Sky.